Vivo has already created a buzz in the market with its flagship phones. The astounding camera and the extraordinary design make us splurge any amount for this masterpiece, but the beauty of the phone is that its price range is within the vicinity of our affording capacity. Vivo has now come up with two astounding models Vivo V5 and V5 plus. So let us discuss the features of both the beautiful masterpieces. As per the leaked images of the phone, Vivo V5 has a 5.5-inch HD display covered with Corning Gorilla Glass 3. The design is sleek and impeccable and a pleasure to hold. Selfies are what makes us fall in love with Vivo phones. It sport a 13-megapixel primary camera along with 20MP front-facing camera with Moonlight flash just like iPhone 6s and iPhone 7. Regardless to say the selfies are magnificent. It harbours a 3,000mAh battery and has Qualcomm’s Snapdragon 652 octa-core SoC (four Cortex A53 cores + four Cortex A72 cores) processor clocked at 1.8GHz. The GPU is Adreno 510. Vivo V5 has 4 GB RAM and 32GB internal storage that can be expanded up to 128 GB via microSD card. The phone is an Android 6.0 Marshmallow with Vivo’s FunTouch OS running on top and has a Hi-Fi audio chip to offer better sound quality, both on speaker and on headphones. Vivo V5 Plus is expected to harbour a bigger battery and display. Also, the resolution will be higher. 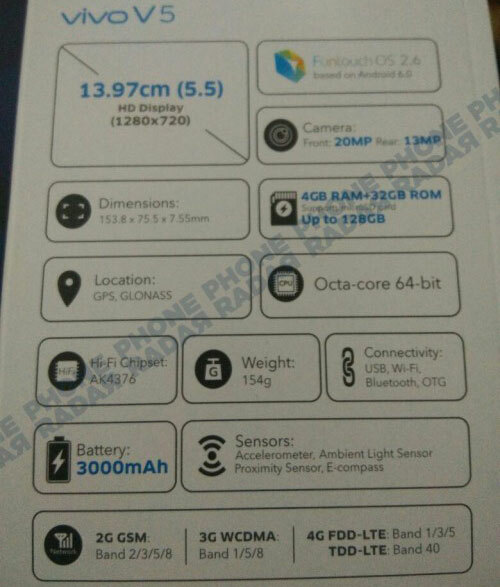 Rest of the features are expected to be similar to Vivo V5. 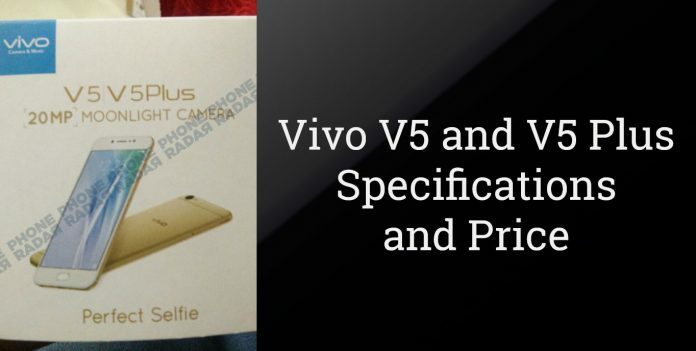 Though not much is known about the actual specifications of V5 Plus. Both the phones are expected to share a similar design, i.e. a metal unibody design and 2.5D curved glass on top. The home button that is placed at the front is expected to come embedded with a fingerprint sensor for biometric authentication. Both the phones have high-end features and are expected to fall under 20,000 INR. The phone is such a relief to the eyes and a titillation to the heart. The launch event of the two phones is taking place today. Grab your phones soon before everyone else does.